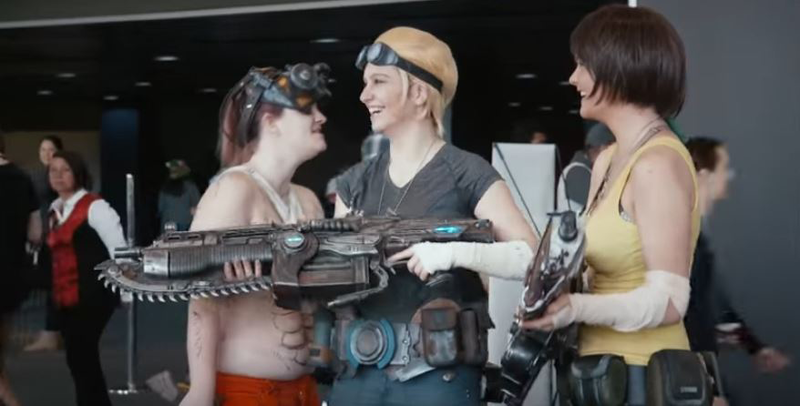 This isn't conventional for a university, but PAX is part of the gaming world. We understand that students want to get here, to get known as people who are active in this space, so we're being proactive. The BICT is a specialist degree with both a theoretical and practical focus. It develop technological understanding and skills that are in high demand world-wide, plus builds project management and other business soft-skills that make you an ICT professional. "Our ICT Project was to create a mobile based game for local game developer, Secret Lab. I want to be a project manager, and the ICT Project units helped match my expectations to reality." Human Interface Technology Laboratory (HITLab) is a research and teaching facility focused on building advanced human-computer interface technology. It allows us to explore new forms of interface technology made possible by infrastructures such as the NBN and Ubiquitous Computing to realise interfaces in the wild. Special facilities in the HITLab include Surface Research equipment, in particular the VisionSpace, a three-screen immersive stereo projection system enabling groups of people to view and interact intuitively with virtual 3D data; and an Access Grid, a high-end, collaborative communication facility including HD videoconferencing capabilities. Students have opportunities to undertake elective units or develop projects using HITLab AU. Our international exchange programs offers you the chance to gain amazing global experiences while you study, with opportunities ranging from two-week study tours, to semester exchanges at partner universities around the world. We’re here to help you every step of the way, including offering a range of scholarships and financial assistance options. You may also be eligible for OS-HELP Loans or scholarship funding to assist with airfares, accommodation and other expenses. Students also have the option of undertaking an elective at the end of their second year to do an industry placement for six weeks and gain industry experience in their chosen ICT field. Our close connections with Tasmania's vibrant and dynamic ICT industry mean there are opportunities across a wide spectrum of ICT companies, plus ICT roles in other organisations. Information and Communication Technology is a core function of industries all over the world. It contributes to everything from maintaining a company’s daily operations, to eScience, productivity gains, innovation, expansion, and job growth. This gives you truly global job opportunities, allowing you to forge a great career wherever your interests take you. This is a career that rewards professionals who can take initiative and work independently, and rewards those who can multi-task and adapt. It is great for people who like to lead, as well as those who like operating in a team environment. Graduates often enter technical positions, such as software programmer, network administrator, systems or business analyst, and web design/development. These allow you to apply your skills and knowledge while building on the industry experience already gained from your time studying with us. Technical roles progress to management and leadership positions, typically with 3-5 years’ experience, setting you up in a career for life that goes wherever you want it to. These include project managment, business analyst, testing/network/systems manager, database administrator, security specialist, and much more. The BICT has full, professional-level accreditation from the Australian Computer Society (ACS). This endorsement recognises that the degree is responsive to the current and future needs of the ICT industry. Graduates of the BICT are eligible for membership of the ACS. All students study core subjects in ICT Professional, developing the skills and knowledge necessary to implement technical skills in business environments. You will also choose a second major to focus the technical side of your degree. Learn the complex process of identifying problems within a business, understanding what the implications of those problems might be, and developing ICT based solutions supported by industry best practices. In addition to technical skills, you will learn project management and communication skills that provide the much-needed link between business and technical experts. The highly connected world we live in is filled with threats to our systems and devices. This major will enable you to get a foundational understanding of these risks, including the fundamentals of encryption systems, penetration testing, and eForensics, and how to respond to protect businesses and systems of various sizes. Big Data is now a core function within government, commerce, and science. This major provides an opportunity to explore new kinds of data, the tools for processing it, and to learn how to capture, manipulate and process huge volumes of digital data and transform it into usable information. This major provides a detailed understanding of the processes and technologies used in the development of games and interactive systems. You will learn to design, model and program with industry leading technologies, tools and languages, including VR/AR technology that is applied in the game and multimedia industries today. * Offered in Hobart, and Launceston (Year 1 only). ** Offered in Hobart, and Launceston (Year 1 and 2 only). *** Offered in Hobart and Launceston. Credit for appropriate studies completed at TAFE and/or other university courses may be granted, including the Associate Degree in Applied Technologies offered through the University College. As a school leaver, if you do not meet the minimum ATAR you should consider enrolment in the Diploma of University Studies as a pathway to the Bachelor of Information and Communication Technology.